FDA has a new program called, The Experiential Learning Program, which involves CDRH going to medical device companies, manufacturers, and service providers to discuss biocompatibility, in vitro diagnostics, clinical trials, and other areas. On today’s episode, Mike Drues of Vascular Sciences and Jon talk about the advantages and disadvantages of this program that encourages reviewers and companies to spend more time together. The better the reviewers understand the development processes that medical devices go through, the better they can work effectively with the companies to get medical devices on the market. ● Who’s job is it to teach CDRH staff on how medical devices are developed? ● When an FDA visitor is in the building, will the visit be realistic to open and honest discussion? Or filtered and sanitized? ● Visits could work to your advantage. You can “toot your own horn” as a medical device company that has a good regulatory process and sets the bar for quality. ● Skeptics may view the program as a sneaky way for FDA to come in, inspect what’s going on, and force changes - involves companies taking calculated risks. ● CDRH wants to teach staff about certain areas. They should already have subject matter expertise, but may have never been trained. ● CDRH should share information and experiences with medical device companies to improve collaboration without disclosing confidential details. ● Visits offer opportunities for two types of companies: 1) device manufacturers and 2) service providers. ● No good deed goes unpunished. So, make sure you have all your “ducks in a row.” If you want to schedule a visit, there’s a submission deadline of Sept. 26. Announcer: Welcome to the Global Medical Device podcast where today's brightest minds, and the medical device industry go to get their most useful and actionable insider knowledge direct from some of the world's leading medical device experts and companies. Jon Speer: Did you know that FDA has a new program called the Experiential Learning Program where CDRH is interested in coming to medical device companies, manufacturers, service providers and so on to learning about certain areas such as biocompatibility and in vitro diagnostics and combination products and so on? 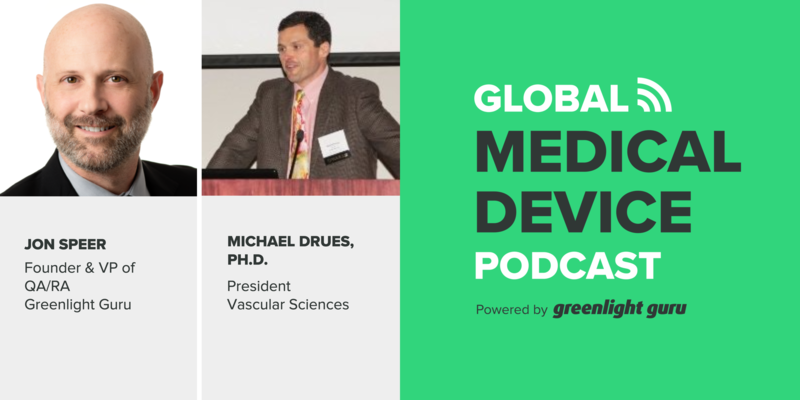 Jon Speer: Well on this episode of the Global Medical Device Podcast, Mike Drues and I talk a little bit about this Experiential Learning Program and be sure to check out the links that accompany the podcast so that you can learn more. 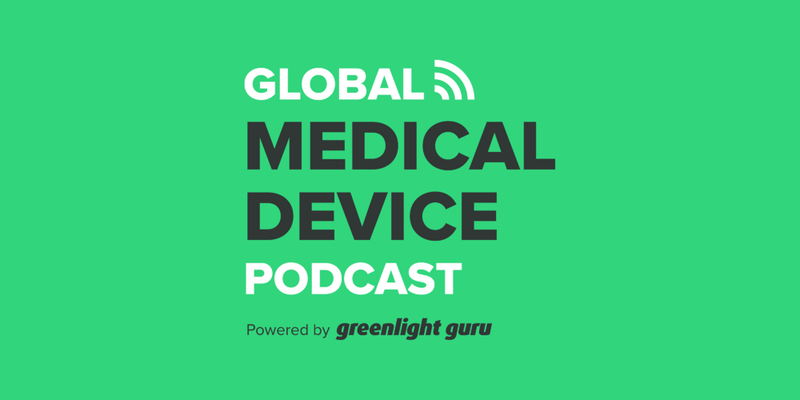 Jon Speer: Hello and welcome to the Global Medical Device Podcast, this is your host, the Founder and VP of Quality and Regulatory at Greenlight Guru, Jon Speer. And my guest today is Mike Drues with Vascular Sciences, welcome Mike. Mike Drues: Thank you Jon, great to speak with you today. Jon Speer: Yeah, sometimes we dive into sort of the weeds or, and other times we talk a little more philosophically and I think today may be more the latter or we're going to speak about this program that is in place at FDA, it's called the CDRH Experiential Learning program and I don't know by the time this goes live for folks that they'll have an activity or an opportunity actually to participate in this particular round. Jon Speer: But I thought we could talk a little bit about this Experiential Learning Program, what do you think? Mike Drues: I think that would be a great idea Jon. Jon Speer: So what do you know about this program? I mean it's, to my knowledge it's pretty new. I don't know a whole heck of a lot about it myself. I've been researching it, try to learn a little bit more, but are you familiar with this program? Mike Drues: I am Jon, and thanks again for the opportunity to talk about this. You mentioned it's new well, this particular version of the program is new but to be fair, FDA has had a number of both formal as well as informal initiatives to try to encourage reviewers and companies to spend more time together in some cases they would invite folks from companies into the FDA to do a little show and tell. Mike Drues: This is sort of the opposite, this is the an opportunity for companies to invite FDA reviewers and other CDRH staff to come and visit companies on site. And so the idea in a nutshell is the manner that the reviewers understand the development process that medical devices go through the better they can work effectively with the companies to get medical devices onto the market which is obviously all of our goal. Mike Drues: But like everything Jon, there are advantages and disadvantages and that's something that I think we can get into here. Jon Speer: Yeah, so I guess a couple questions that kind of, and I've looked over the current list of areas that FDA has soliciting participation from industry, but I guess one question that comes to mind, is it our job as a medical device companies, is it their job to teach CDRH, or CDRH staff on how medical devices are developed? I mean is it, shouldn't this be, I mean should it be the other way around? I mean what do you think about that? Mike Drues: Oh that is indeed a terrific question Jon and let me phrase it a little bit more provocatively and that is do we really want people working in the FDA reviewing medical devices who have never been involved in bringing a medical device onto the market in the first place? Is this the sort of learning to do surgery who from somebody who has never done surgery themselves before but has learned about it by reading it in a book. Mike Drues: I would like to think that this person would be equally familiar with the development process as the folks working in companies but obviously that's not always the case. Jon Speer: Well I mean and yeah, it seems I'm going to get the initiative here and I think at least from my outside looking in observation or vantage point, it does seem like recently within the past couple years, there's a lot of programs that are now in place with FDA the Experiential Learning being one, things like the pre submission program that you and I have talked about being another, Kings for Quality being a third. Where it seems like FDA is making attempts to really be more collaborative and interactive with medical device companies. Jon Speer: But with that being said, I mean if I were to invite CDRH to come visit my facility to learn about medical device product development or X or Y or Z, and how realistic is that visit going to be? Mike Drues: Well, listen Jon, let me be crystal clear here because I don't want our audience to misunderstand the intent of our conversation. I'm all for more communication and I'm all for face-to-face communication whether it happens within the buildings of the FDA, whether it happens within a medical device company, I don't really care. Mike Drues: But you just hit the nail on the head. How realistic is this communication? You know CDRH wants their staff to become more familiar with the development process, that's of course an admirable goal. But when CDRH staff comes into a company will they be exposed to a real open and honest discussion that should be held within a company when we develop our medical devices every single day? Mike Drues: Or will everybody in the company be on their best behavior so to speak when an FDA visitor is in the building? I mean both very, very experienced when it comes to manufacturing inspections you know usually all of the employees are notified in advance and everybody is on their best behavior and nobody really wants to say anything. Mike Drues: So the question is how realistic is this going to be? Is it going to be open and honest or is it going to be very filtered and sanitized? That's an interesting question. Jon Speer: Yeah, and you and I talked recently sort of about the best practices of highly effective, quality, true-quality professionals and I think one of the things that I had mentioned is you shouldn't behave or act differently just because there's an FDA inspection happening or an ISO audit happening. And this would be one of those examples that if you see your agents is onsite at your facility, this should be business as normal for the most part. Jon Speer: I mean granted you're teaching CDRH here, but if you change your behavior just because you have an FDA visitor in the building, there might be something else that you need to focus on. Mike Drues: You're right Jon, I could not agree with you more. But on the other hand, I don't think that you and I certainly did not fall off the turnip truck yesterday. Jon Speer: No. No, not at all. But at the same time, I mean it seems to me that this could work to my advantage as a medical device company if I believe I have a good practice or a good process and I want to be known for that within the regulatory circles if you will. That this potentially might be a great opportunity for me to kind of toot my own horn so to speak. Mike Drues: That's actually correct Jon and thank you for bringing that up because I think the folks that are more savvy in our audience are going to realize that using this program or a similar program can be a huge advantage to us. If we're doing something for the first time as a company or if we're doing something differently, or if we're doing something better, that would give us the opportunity to invite the FDA to come in to kind of teach them what we're doing. Mike Drues: But more importantly, to set the bar so that this is sort of the expectation that FDA has and now our competitors have to meet our particular expectations of where they set the bar. So now we're talking about a much more sophisticated way to use regulatory or quality strategy using this tool that FDA just gave us to our advantage. Jon Speer: Now I know just as many probably more people are going to think more skeptically than that Mike. I can imagine that the skeptics out there are going to be saying "Yeah, this just seems like a sneaky program for FDA to come in and see what's going on at my company and secretly take notes so that they can send that over to a future inspector to come and ding me for things." Any thoughts about that? Mike Drues: Well I do Jon, thank you for bringing that up. Again, you're right [inaudible 00:09:35] here, but FDA is quite clear in their announcement and let me just read a portion of it for the benefit of our audience. "These formal trained visits are not intended for agency staff to inspect, assess, sorry, to inspect, assess, judge or perform regulatory function such as compliance inspections" and so on. Mike Drues: But best of intentions, sorry Jon, if an FDA visitor happens to notice something in a company that they're doing or alternatively that they're not doing let's just say quite kosher so to speak, what are they expected to do with that information? Are they expected to just sit on it and not tell anybody? Mike Drues: I'm not sure that would be an ethical thing to do. If they are telling, going to tell somebody, then they have just violated the intention of this program. So clearly these kinds of words and these statements from FDA are written from the, by the politicians at FDA. It sounds good, it makes people feel good, but what does it really mean in reality? Mike Drues: And finally Jon, will the company really want to take a risk assuming that they don't know of any problems? On one hand you have as we just talked about the opportunity to invite the CDRH staff to come in to educate them, but on the other hand you're taking a calculated risk to achieve. If they do find something that doesn't quite smell right, you have now just created a problem where no problem existed before. Jon Speer: Yeah, it's a rhetorical question that I don't really have a good answer to, but certainly something to weigh in as companies consider whether or not this program is something that they want to participate in. It might be helpful if we share, at least in this current round of the experiential learning program, some of the areas that CDRH wants to train their staff, and those are areas that include things like bio-compatibility, combination products, clinical trials, device development, digital health software, IVDs, etc. Jon Speer: But you know, if there's a CDRH person or staff that's already working in one of these areas, Mike, I got to believe that they should already have some subject matter expertise. What do you think about that? Mike Drues: Well, Jon, I agree with you 100%. Somebody is working in FDA in any of the areas that you just mentioned. Whether it's bio-compatibility, or In Vitro Diagnostics or what have you. I would certainly like to believe that they already have quite a bit of subject matter expertise in those areas. And, quite frankly, if they walked into a company and learned something new, you know, that's indicative of whole new set of problems, you know, so. Mike Drues: But on the other hand, I also, like I said, I didn't just fall off the turnip truck yesterday, that's not always the case. There are folks in FDA, and to be fair, Jon, there are also a lot of folks working at companies who are doing things that they've never been trained to do, that they've never ... are not subject matter experts in. And you know, I happen to be, as we've talked about before, Jon, a recognized subject matter expert for FDA in a few different areas. I take that responsibility very seriously. I would like to think that others would feel the same. Jon Speer: Right. And, I mean I don't ... what I read to this is that this a pretty one-sided exchange where the medical device company is sharing with FDA. Do you know, is CDRH, are they sharing their experiences with the medical device company too so that there's true collaboration? Do you have a sense of that? Mike Drues: You know, that's a good question, Jon. I would like to think that since FDA is putting this offer out to industry, which is again, let me be clear, an admirable goal, that that would be a two-way street. That FDA would also be willing to share with companies their experience, their practices. They don't have to mention specific company names or anything like that obviously, but share that kind of information to truly work in a collaborative fashion. I would like to think that, but at least in my experience, Jon, and perhaps you or others might disagree, that street usually does not run in two directions, because FDA is very sensitive, I would say hyper sensitive, probably too sensitive, that giving a company information about how a competitor is doing something or something like that. There are proprietary issues, there are conflict of interests, but those can be managed. Mike Drues: Use myself as a simple example, Jon. As you know, I work with lots of different companies, and often times I'll walk into one company and that company knows for example that I'm working with one their competitors, and they'll ask me a question like, "Hey, how does our competition [inaudible 00:14:52]." And [inaudible 00:14:55] laughing, Jon, I get asked this many times, I say, "Well obviously I can't tell you that." "Why not?" "Because for the same reason that next week that I'm in your competitor's company and they ask me the same questions, you're not going to be teeing on me telling you that information." Mike Drues: But here's the way I handle that, Jon. Often times by my knowledge of what their companies are doing, I can ask a company a question, "Gee, have you considered the following?" Or, "Have you thought about the following?" Or "What if...?" So there are ways that this relationship between a company and the FDA can be very collaborative, but without disclosing any confidential or proprietary information. But regrettably, Jon, at least in my experience, it's not often done. Mike Drues: As a matter of fact, I'll use one last example, and then I would love to hear your thoughts on this, Jon. It's kind of like advertising off-label use. You can advertise off-label use very legitimately, you just have to be very careful how you do it, right? So this is the same kind of thing. You can have these conversations, and I try to do it frequently in pre-submission meetings, you mentioned this earlier, but you just have to be very careful how you do it. Mike Drues: What do you think of just particular point, Jon? Jon Speer: Well, I mean if you look at the, goodness, like I said in this round, some of the areas that CDRH wants training for it's staff bio-compatibility, combination clinical trials and so on, it doesn't seem to be a product specific per se. It seems to be more of an attempt, or an interest, in to try to hone in on some best practices. And I don't know how many companies, I should know this, I don't even know if the CDRH information even specifies, but I don't if they're looking for half a dozen companies to share in each of these areas, I don't know. Do you happen to know that by chance? Mike Drues: I don't have any specifics on that, Jon. I'm not sure if any of those numbers are publicly available or not. Mike Drues: I'll have to dig into that a little bit. Jon Speer: But, it seems to me you know, FDA is ... they're very much, I don't want to say unique, but they're in a situation where they get to see essentially everything for all companies who want to bring products to market. So they're in a position to be able to really evaluate sort of best of breed if you will, sort of best practices certainly, and it seems to me that if, to your point, they might not be able to say, "Oh well, your competitor company ABC is doing it this way," that would be kind of a breach of, or a conflict of interest or a breach of confidentiality for sure. But in the same token, and you know if there is expected best practices that companies should be aware of or that companies are doing, that CDRH should be aware of, I think this is the promise of this type of program where it can kind of raise the bar as far as of what we should be doing as far as best practices. Jon Speer: To a point that you've made a time or two in the past in our previous conversations, just complying with the regulations is the equivalent of a C student. So perhaps this is an opportunity to show off that you deserve a B or maybe even an A with CDRH. Mike Drues: Well, once again, Jon, I agree. And we have to be a little careful we're not over generalizing when we use the word company here, because there are at least two different types of companies that I can think of. One is the device manufacturer, the folks that are actually manufacturing and marketing medical devices. But then the other are the service providers. Mike Drues: You mentioned quality or bio-compatibility. There are a lot of companies out there that provide a particular service, not necessarily a device, but they do bio-compatibility testing, they do packing integrity testing, whatever it is. I see this as an interesting opportunity for these service providers to invite FDA to come in, let's say hypothetically, we talked about subject matter experts a moment ago, Jon, I happen to be a subject matter expert for the FDA in a few areas, one of them being bio-compatibility. So let's say that a company who specializes in doing bio-compatibility testing is developing a new type of bio-compatibility test. They would like this test, after it's fully vetted of course, to become a new industry standard. What better way would be to have that company under a program like this invite some bio-comp folks from FDA to come in and say, "Oh by the way, we've just developed this new bio-compatibility test that we think is the greatest thing since sliced bread, and if you agree, maybe you might start asking companies to start doing this." Mike Drues: And if you're really clever, Jon, if you're the only company that can do this, now you've just got FDA to do your marketing for you, because now you've got FDA saying, "You've got to do XYZ test, and oh by the way, there's only one company that can do XYZ test." So, using the strategy here can get quite interesting when you're a little bit creative or imaginative with it. Jon Speer: Huh. I mean that's a really insightful angle to consider, because you know, it's not like I'm going to get a patent per se or something super proprietary, but at the very least I might be able to use this to my advantage to establish the ground rules if you will, for others who may be doing something similar to me, but be the gold standard in the eyes of CDRH. I mean, that's really strategic way of thinking about this. Mike Drues: Well I'm glad you agree, Jon. And of course the same logic is applied to other types of service providers including companies like yours that develop tools for quality management and so on. So if you have what you think are the best in the industry methods to do something, what better opportunity would there be to invite FDA in to do a sort of a show-and-tell and kind of get them to help sing your praises as well. Mike Drues: So that's the advantage for companies that are in service providers. Perhaps the last thing we should talk about, Jon, is the advantages for medical device manufacturers. And here I see the biggest advantage is kind of like a pre-sub. You can think about it as a pre-submission meeting held at your company as opposed to at the FDA. If you have new technology, I don't mean a me-too, I don't mean you're coming out with the 200th version of a ball on cap or something like that. But if you have something truly new and novel, either the device or the manufacturing process, or perhaps your purgatory or quality systems. If you have something that's really different, that's really what you think is good that perhaps the FDA has not seen before, and you want to establish the bar at higher points across the industry. And also you want to give the FDA sort of a heads up of your technology before you take it to them in sufficient or even as a pre sub. What better way to invite them to come in and sit down and you know give them a cup of coffee, are we allowed to give them a cup of coffee? Mike Drues: But saying you know let up tell you about our new technology and oh, by the way, if all goes well we hope to be coming to you with a pre-sub design of this in a few months and a 510(K) or De Novo or PMA submission a few months after that. So this is a very interesting tool, but like any tool, it can be used very effectively in the hands of someone who knows what they are doing, in the hands of someone who doesn't know what they are doing, it can cause a lot of damage. Mike Drues: No I like the angle if I can have an audience, a captive audience of CDRH staff at my facility and they have a you know at least an opportunity to be engrained in my culture and understand our product portfolio now only the things we have on market, maybe some of the things we have on queue that we're working on and you know the big idea, the big initiatives that were trying to, how were trying to improve the quality of life, and I can share a glimpse of my regulatory strategy and how things will kinda line up as far as you know provincial pre-subs or 510(K)s or what have you. Yeah I think that that can be a real advantage for a company, they get a off the record but important glimpse from CDRH as to how their strategy lines up with FDA interpretations, I think they can be really advantageous. Mike Drues: I think so as well Jon, with one small but important caveat -- make sure you have all of your ducks in a row, make sure you have all your closets cleaned our so to speak before any CDRH employees come in, because regardless of the intentions of this program, this is something that could possibly go south if you aren't careful. Jon Speer: No good deed goes unpunished right? Mike Drues: That's right Jon, last thing I will mention and then perhaps we should wrap this up, and this is directed to any of my FDA fellows that might be happening to listen to our conversations, and I know Jon since many of the reviewers in FDA are personal friends of mine. Some of them do actually listen to our conversations, so I really appreciate that. If this is such a great program, why is FDA ending it at the end of September? I think this is something that should be ongoing and even if FDA hypothetically speaking, they do now for whatever reason, do not decide to continue it, that does not preclude a company if they decide that if they decide based on what you and I talked about today, that the advantages of inviting CDRH to come avoid the disadvantages, frankly I could care less if the program officially ends or now, you always have the opportunity to reach out to FDA and say, hey we would like to invite you to come in and do a little show and tell and get to know each other a little bit. Mike Drues: The worst thing they can say Jon, is no. And one of the most important lessons that I learned as a graduate student many, many years ago, you don't get if you don't ask. So guards of the long term status of this program, I do think that it would be worthwhile if a company thinks that the advantages are greater that the disadvantages to continue to build this collaborative relationship, and to take this a little further and now be overly provocative, but if the company does extend the invitation to the FDA and FDA does say no, I would consider pushing back and saying you know what, I understand your position but I hear all of the folks at FDA saying, we want to encourage more communication, more dialogue between the industry and FDA, here we're trying to do exactly that and seems like you're not meeting us half way. Believe me, I will push when its necessary to do whatever it is we're trying to get done. Jon Speer: Yeah and, functions should give you a little bit more context of Mike's referring to this current CDRH experimental learning program as an open submission timeline up until September the 26th so depending on when you are listening to it, that day may be moments away or may have come and gone, so just keep that in mind then we'll provide links to the experimental learning program as far as that's concerned details, then we'll provide a link to a training needs templates that defines some of the areas that the CDRH are interested in. Mike Drues: One last suggestion Jon, this might sound a little strange for those in the audience who know me but occasionally I will take a contrite strategy if somebody is listening to this after the deadline and they and their company believe that the advantages outweigh the disadvantages, even after the deadline is over, you could always contact the FDA and say, look we're sorry we just learned of this program, we would like to take advantage of it sooner, is there any way that we can still invite you to come in... The worst they could say is no, and if they did, I would say cause that's an opportunity to push back, so overall I think that although there are advantages and disadvantages I think overall, there are more advantages for the company as well as the FDA. Mike Drues: I do think there are a few caveat hesitations but I would like to see this program extended, I would not encourage FDA to make this periodic, this should be an ongoing thing, essentially forever, again Jon we hear people all the time at FDA as well as leaders in our industry saying, we want more communication, we want more collaboration between industry and FDA, my challenge to all those folks is, those words are easy to say, talk is cheap, but put your money where your mouth is. I think this is a good program and I hope to see it continue. Jon Speer: Yeah, I'm right there with you, so folks like I said, I'll share some information about this CDRH experiential learning program that'd be on text that companies that podcast. Be sure to check that out in my morn. Mike I want to thank you once again for joining me on the Global Medical Device Podcast. Mike Drues with Vascular Sciences and we didn't talk a whole lot about regulatory strategy per say or even quality management system details, but if you're focused one, or ask questions about regulatory strategies, as always reach out to Mike at Vascular Sciences and he's one of the best for sure. Of course if you're interested in learning more about your quality management system strategy and implementing a best-of-breed medical device specific solution, I would encourage you to go to www.greenlight.guru to learn more about what we're doing and how we're helping medical device companies all over the globe, get new products to market faster, survive ISO audits and FDA inspections with a breeze, so be sure to reach out to us. Once again this is you're host, the founder, and VP of Quality and Regulatory at Greenlight Guru Jon Speer and you have been listening to the Global Medical Device Podcast.